How will we respond when a student has mastered the learning? Professional learning communities must work together to achieve their collective purpose of learning for all. 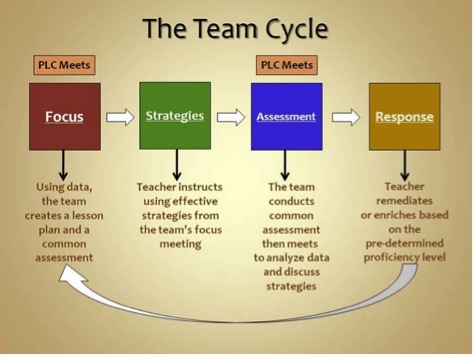 PLC collaboration is a systematic approach in which teachers work together to analyze and improve classroom practice. Teams focus their efforts on the 4 guiding questions related to learning. Professional learning communities work together to improve student achievement and this focus on results becomes the routine work of everyone in the school. Every teacher team participates in an ongoing process of identifying the current level of student achievement, establishing a goal to improve the current level, working together to achieve that goal, and providing periodic evidence of progress. Using this approach, teachers will collaborate to find strategies to improve and personalize learning for all students. Below is a diagram of what a cycle looks like for each team. References: DuFour, R (2004). What Is a “Professional Learning Community?.” Educational Leadership, 5-6.